↑ Fichner-Rathus, Lois (2012). Understanding Art (with Art Coursemate with EBook Printed Access Card). Cengage Learning. p. 336. ISBN 1111836957. Retrieved December 14, 2012. 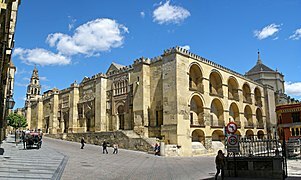 ↑ "Mosque-Cathedral of Córdoba". Encyclopædia Britannica, Inc. Retrieved 4 November 2012. ↑ 5.0 5.1 5.2 Armstrong, Ian (2013). Spain and Portugal. Avalon Travel Publishing. ISBN 9781612370316. On this site originally stood the Visigoths' Christian Church of San Vicente, but when the Moors came to town in 758 CE they knocked it down and constructed a mosque in its place. 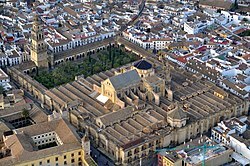 When Córdoba fell once again to the Christians, King Ferdinand II and his successors set about Christianizing the structure, most dramatically adding the bight pearly white Renaissance nave where mass is held every morning. ↑ 6.0 6.1 Sills, Ben (2004-04-19). "Cathedral may see return of Muslims". The Guardian. London. ↑ Fuchs, Dale (2006-12-28). "Pope asked to let Muslims pray in cathedral". The Guardian. London.